For the last few years, part of my annual “Best of the Year” routine has been to look back at how my anticipations matched up with reality as I look ahead to the coming year. So before I dive into my most anticipated games of 2019, let’s reflect on how my most anticipated games of 2018 availed themselves. Quite appropriately, I predicted it wouldn’t actually hit its 2018 release date saying “hopefully I’ll still dig this one...when it actually comes out in 2019.” But with every trailer in 2018, I found myself more and more frustrated at just how much the series has lost me. I loved the first two mainline games in the series but listening to friends talk about the franchise now feels like a foreign language to me. I’ll still pick it up when it releases later this month but my excitement for it is at a bare minimum at this point in the hopes that I’ll be pleasantly surprised. The only reason this wasn’t higher on the list (I imagine) is because I didn’t think it’d actually come out in 2018 at the time. But placing it at number 4 wound up being a little prophetic as it was ultimately number 4 on my favorite games of 2018 list as well. I wasn’t the biggest fan of having to relearn the fight mechanics each month against the toughest enemies in the post-launch DLC but my time with the game still made for some of my favorite gaming in 2018. Funny to see my 2018 Game of the Year here at number 3 on the most anticipated list but that just shows me how much of an unknown it still was this time last year. It wasn’t until people really started seeing the full scope of the game in its April launch that it showed its true colors. Based on this outing, I guarantee the eventual sequel will be at the top of my Most Anticipated List for whatever year it comes out. Detroit: Become Human held the number 2 spot out of my sheer love of the subject matter: a choose-your-adventure game with a central focus on AI robots confronting and demanding their own humanity. It’s ultimately spot near the bottom of my top 20 doesn’t really take away from the excitement I felt for it or even my enjoyment of the final product. It’s more a testament of all the games that surprised me last year. Well, this was a complete misfire. I’ll cover this more in an eventual write-up about my top disappointments of 2018 but Far Cry 5 was ultimately one of my most forgettable experiences of 2018. I don’t necessarily think it is a bad game, it just failed to live up to its potential on nearly every front. It has left me feeling the opposite of my God of War sentiments. The blandness of this game will keep the upcoming Far Cry New Dawn and any future installment far away from my “most anticipated” lists moving forward. With that reflection done, it’s time to look ahead to 2019. I think I first really thought about this while I was in Baltimore for the Irrational Passions Extra Life weekend last year. If I am remembering correctly, a few of us were driving somewhere and somebody asked what 2019 games we were excited about and I had no idea my answer, mostly because I think we’ve reached the point where a lot of the big companies aren’t announcing firm dates now until they’re sure they can hit them after early backlash from this generation over games being routinely delayed. As a result, a lot of the games I’m probably most excited for don’t have firm dates so I don’t know whether they’ll come out in 2019 or not. But here are a few that either do have dates or are at least promoted as “2019” at this point. Out this week as I publish this article, YIIK: A Post-Modern RPG is a game I’ve had my eyes on since PSX 2015 in San Francisco because it gave me some serious Earthbound vibes. Having routinely seen the game at PAX events since (and finally playing it at one of them), I’m very excited to finally play through this trippy look back at turn-of-the-millenium Americana in the form of a polygonal turn-based RPG. This is the game on my list that has the most potential to be a sleeper favorite like Horizon Zero Dawn (which wasn’t even on my 2017 Most Anticipated list) or God of War. Or it could be another Far Cry 5. I saw it played behind closed doors at E3 2017 and its gameplay struck me as Horizon but with a post-apocalyptic biker instead of a robo-dino wrangler so if nothing else, I think I’ll really enjoy the game’s combat. Whether or not its story and open world will grab me is the big question mark to be determined. Sony’s first-party slate of games this generation have, for the most part, knocked it out of the park this generation so I’m hopeful Bend Studio will continue that trend. I have zero experience with the Crackdown games but Crackdown 3 has - for many years now - looked like it would be a game filled with some fun superhero-esque gameplay. Adding Terry Crews into the game just makes it that much more appealing. But more than anything, I appreciate Microsoft giving me a reason to dust off my Xbox One. I hope it still works. When posed the question back at Extra Life, I pulled out my phone and looked up “2019 releases.” After discussing games like Days Gone and Crackdown 3, I ultimately landed on Doom Eternal. The Doom reboot in 2016 managed to completely reinvigorate my appreciation for first-person shooters, reaching number 3 on my games of 2016 list. If Doom Eternal manages to match the speed and action of its predecessor, I have no doubt it will make an appearance on my top games of 2019 list as well. 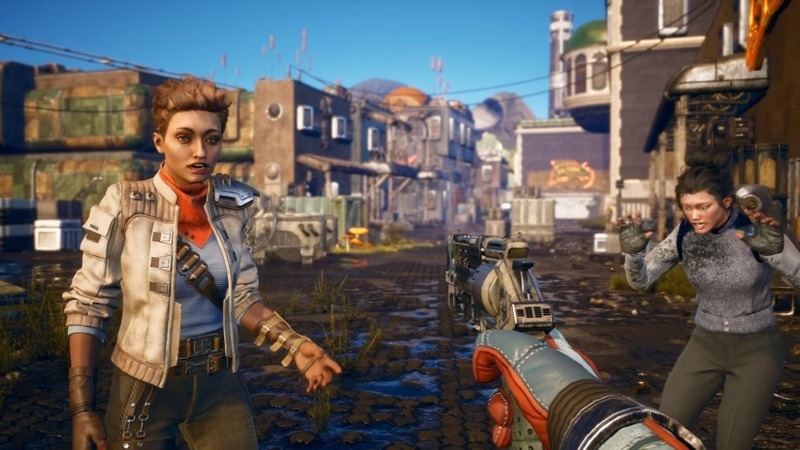 Announced at the Game Awards, The Outer Worlds immediately shot up my most anticipated list. Proudly advertising it’s heritage with the original Fallout creators and the developers behind Fallout: New Vegas, The Outer Worlds is going to bring that level of world-building and masterful single-player RPG design to a space-based setting and I cannot wait. I’m hoping they can out-Bethesda Bethesda with this one and - given Bethesda’s Fallout 76 missteps, I think Obsidian is very much poised to do so. So there you have it. My most anticipated games of 2019. I’m sure there will be plenty of fun surprises throughout the year to supplement these titles but that’s what I’m going with today.